Anyone that can get in front of a microphone and either sing or play an instrument in a metal band ... well, that's something I could never do. 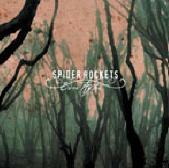 So, as I am listening to the Spider Rockets and their release "Ever After," I hear a hard working band that really puts themselves out there with each and every tune. There are aspects of this band that I found very impressive; however I also found things that I think need some work. The female vocalist does a superb job of getting the band's message out there and the music is very well done, full of emotion and flare that must be commended. As for the negative side, I found some of the songs too slow and repetitive to be very effective. Spider Rockets has the talent and the ability to get their point across, but the music is sometimes difficult to absorb. Still, there's something about "Ever After" that grabbed me. And that means something. For more information, check out www.spiderrockets.com.